The Kid Kraft 2-in-1 Activity Play Table is sturdy and strong, giving young kids a perfect spot for letting their imaginations run wild. 200 LEGO compatible blocks are included, so the good times can start right away. The wooden Activity Table furniture is large enough for multiple children to play at once and features a convenient storage space under the play board. 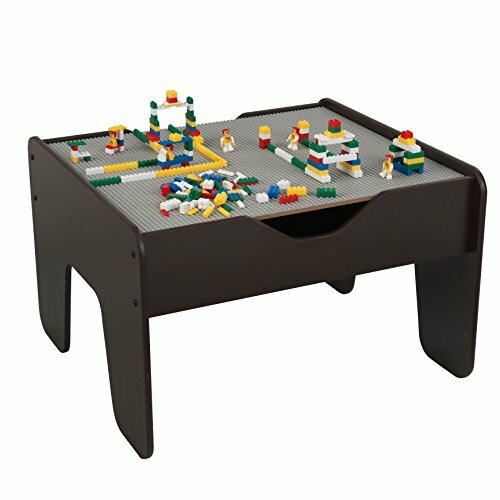 Parents will love how the play table keeps bedrooms more organized and moves the action closer to eye level for toddlers. This is a limited edition in Espresso finish with gray top board. Perfect for hobby and indoor play, building sensory skills, and educational learning. Little ones can also play with their other favorite toys on the board including train sets, action figures, and building blocks. Simply flip the board and get on the action, its that easy! Ideal for any playrooms, nursery schools, daycare and other child play area. Table measures 25 x 23 x 16 inches. For Ages 3 and up.